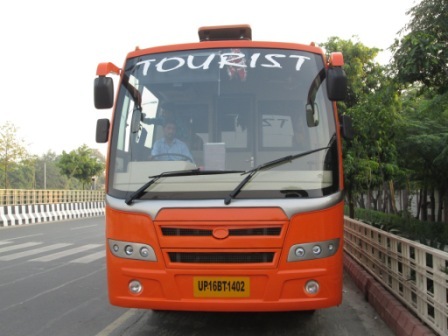 We are provided 41 Seater High-class Bus is among the unsurpassable luxury transportation available in Indian, offering its customers convenience and security. Our 41 seater High-class Bus solutions expands from Delhi to almost all major places of Indian such as Shimla, Kullu, Manali, Chandigarh, Amritsar, Jaipur, Agra, Haridwar, Dehradoon, Mussoorie, Rishikesh and more. The bus has a potential of 41 individuals or less not including 2 chairs for chauffer and assistant. Our developers use Ashok Leyland’s Engines and systems to make the decorations and outside, so that the vehicles are more relaxed and eye-catching for the customers. Our 41 Seater Luxury Buses are ready by using the best technology in industry; hence we are efficiently offering best solutions to both our Worldwide and Household client’s.